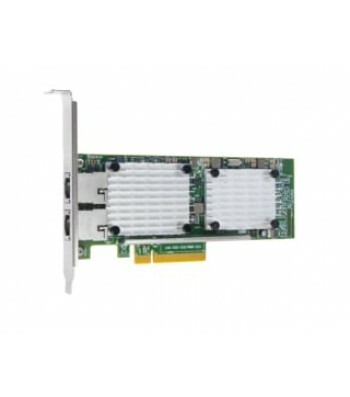 - Combines the functionality of a NIC (Ethernet/iSCSI) and Fibre Channel Host Bus Adapter (FC HBA) onto a single converged adapter reducing the number of adapters and cables thus reducing acquisition and operational costs. - Dual port 10 Gb Ethernet Converged Network Adapter. - Active Health System (AHS). - Sends Fibre Channel data packets via Fibre Channel over Ethernet (FCoE) using Converged Enhanced Ethernet (CEE) functionality ensuring high standards of data integrity and lossless Ethernet. - Provides an HPE-branded Converged Network Adapter solution which has undergone extensive Hewlett Packard Enterprise interoperability testing for connecting HPE ProLiant servers into storage and networking environments. - Optimal for connecting into the B-series and C-series FCoE Converged Network Switches. - Choose between SFP+ SR (optical) or direct attach copper cable connectivity allowing maximum flexibility in connecting to HPE FCoE Converged Network Switches. Er zijn nog geen vragen gesteld over Hewlett Packard Enterprise StoreFabric CN1100R 10GBASE-T Dual Port Converged Fiber 10000 Mbit/s Intern.